Pat Contor loves old wood. 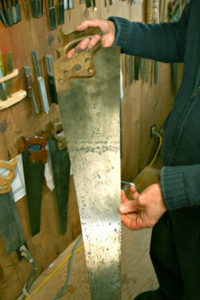 He also has a connoisseur’s taste for old hand saws. Pat’s works as a school psychologist and his main hobby takes the form of building furniture for his home in Bellingham, Washington. His attention to details like dovetail joints and bringing the beauty of wood grain into his functional designs gives him great pleasure and respite. Shown in the first photo, his entryway welcomes visitors with a beautiful piece that he made almost entirely from materials that he found at The RE store. The hinges, the majority of the wood, and the knobs are all reused. 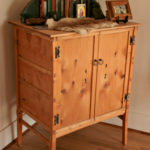 Pat says that the types of wood that he finds at the store make his work a true joy, finding the fine patterns in the grain of a salvaged bleacher board or a piece of green oak that he had to cure himself for years before using. 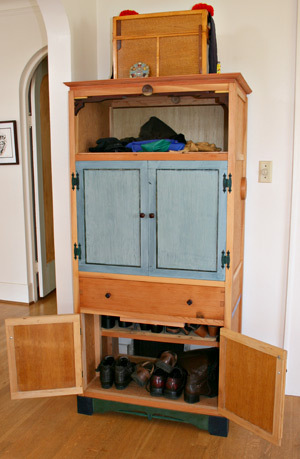 Pat thinks creatively in many ways – the entryway hutch sits in front of a furnace register, heating the bottom compartment of the cabinet. Contor also has a great appreciation for old tools that he has found at The RE Store, especially old saws. He buys them in well-used condition for between 6 and 15 dollars and brings them back to life, resharpening and cleaning them. He showed the care that went into fashioning the handle’s grip (the one in the photo is broken, requiring further restoration) and talked about the quality of craftsmanship that went into the old tools. Pat has gifted these restored tools to students that he works with as a school psychologist, as they have gone on to buy their first homes or taken on building projects. 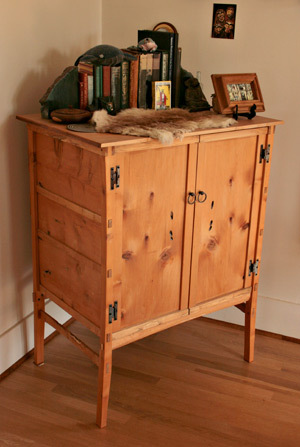 He has also bought items like used end tables and restored or enhanced and given them as gifts as well.